I remember the days before my little guys had their own opinion on clothes. Glory days, you guys. Those were the glory days. And there was nothing more glorious (from a sartorial perspective) than Halloween. My personal favorite was probably Raines’ old owl costume, the one and only time I’ve ever DIY’d anything. Or maybe the crying chicken (Pax’s sweet face was calm for about 5 seconds before he started ripping the costume from his body – Raines had the same reaction three years earlier, which earned that costume the moniker The Crying Chicken). Oh, my heart. Which brings me to my next point: babies may not care what they look like, but they sure as heck care about how they feel. Too hot, too scratchy, too uncomfortable – Halloween is dead to them. DEAD. 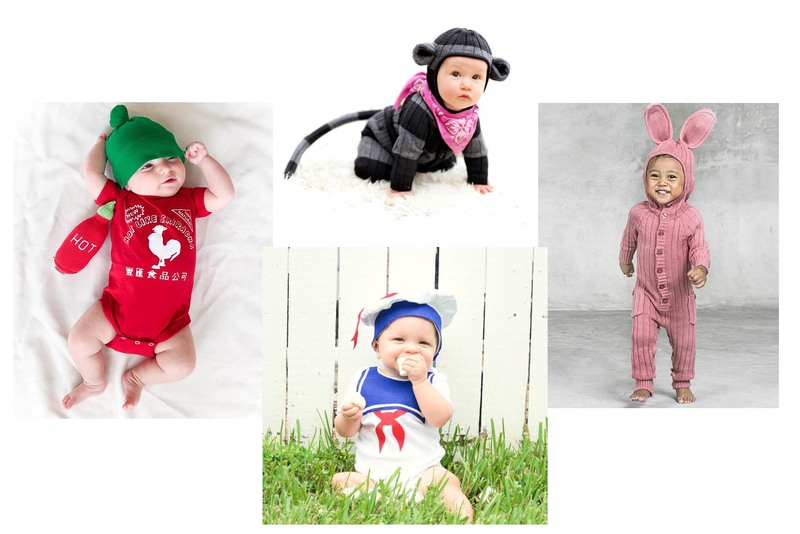 So we rounded up some of the best baby (and toddler and little kid) costumes that are made from…..REAL CLOTHES. Such a genius idea, and there’s no better place to go than Etsy. There’s even a hysterical mommy (or daddy) and me option – it’s truly unisex. It’s….well. YOU’LL SEE. 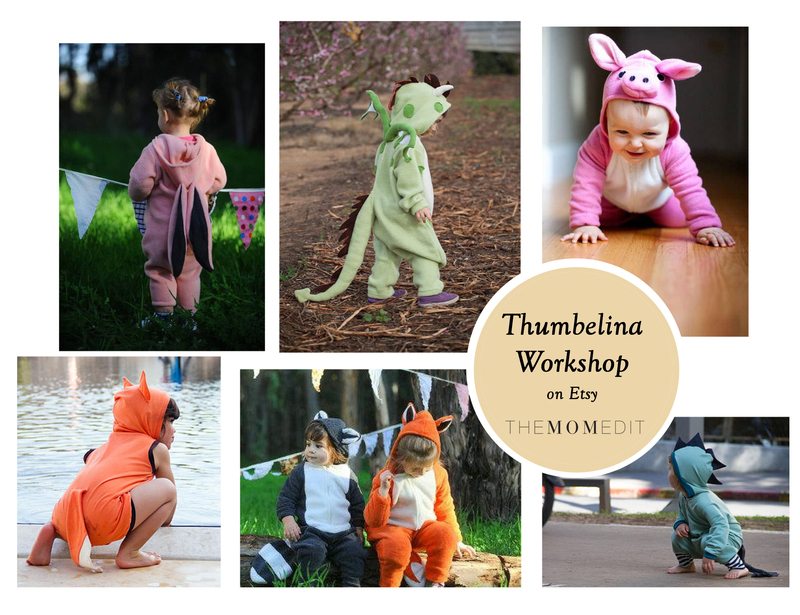 NOTE: If your little one is a bit older, you might like My Favorite Etsy Sellers To Stock Your Dress-Up Box. My kiddos are still wearing those pieces on the regular. 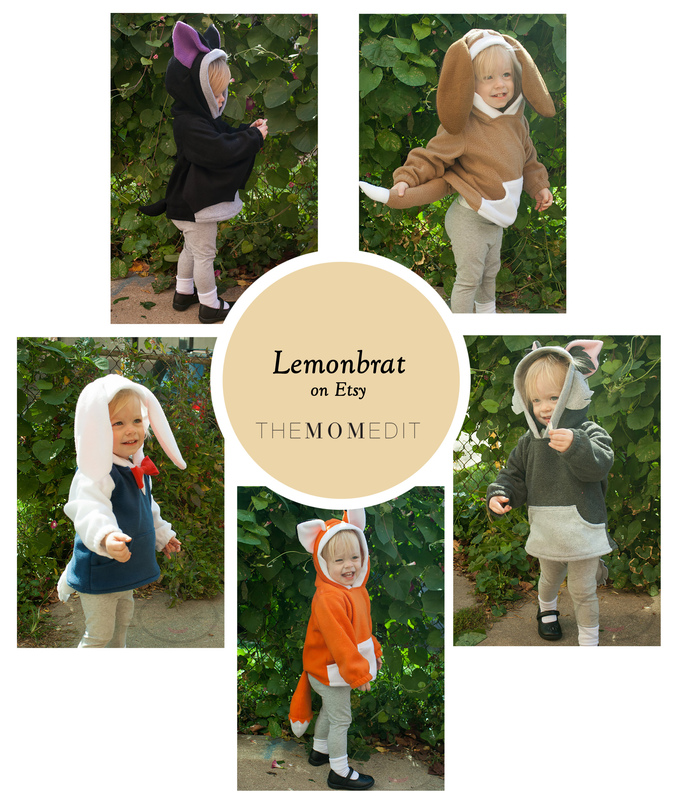 Contributing member of WWF (World Wildlife Fund), Lemonbrat, “Maker of Cute Things”, has a collection of fantastic animal hoodies for toddlers–just as cute and comfortable as they are adorable and warm. This is the kind of thing Pax would’ve worn on the daily – actually, he’d probably still like that Fox hoodie. Who knew how much could be done with a onsie? 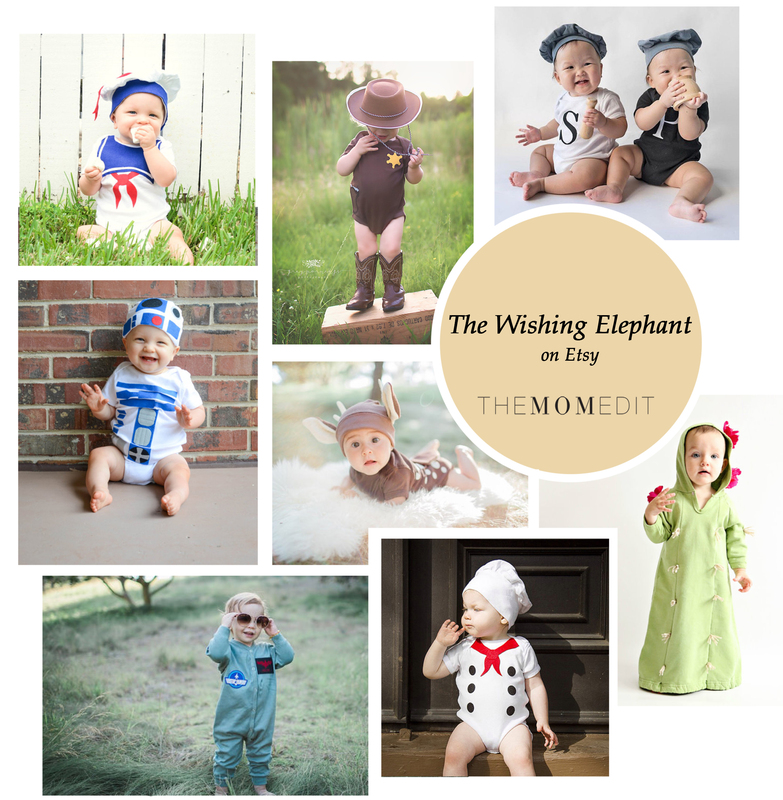 These dynamic costumes for babies and toddlers from The Wishing Elephant are so cute and whimsical – I especially love the little deer, but I can see serious family costume potential with tiny R2D2. BuzzBearStudio‘s baby onesies are our favorites for the cutest, funniest one-pieces out there. Creative and comfy, these adorable costumes made us laugh out loud (Sriracha, anyone?) and are basically Instagram gold. 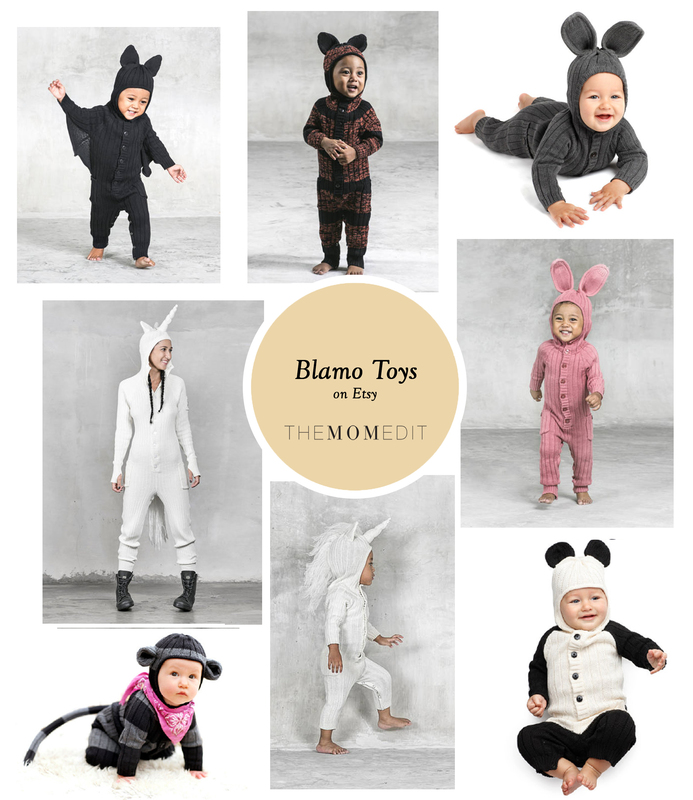 BlamoToys – these knit costumes are some of the most gorgeous I’ve EVER seen. But the real winner here? The adult versions. Mommy (or Daddy) and me unicorns might be my most favorite thing I’ve found on the internet EVER. Shana founded The Mom Edit in 2008. She lives with the love of her life (his name's Mike) and their two crazy boys in downtown Philadelphia. She loves a good styling challenge (her engineering side shows eventually), appreciates kindness, and usually picks scotch over wine, sneakers over stilettos, and denim-underwear, always.